Now we have things together. The high beam problem with its particular idiosyncrasies (see Part 2) and some key ingredients how to solve (see Part 3 and Part 4) . 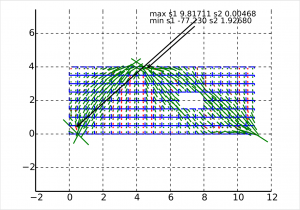 In the end the problem is solved with the finite element method. 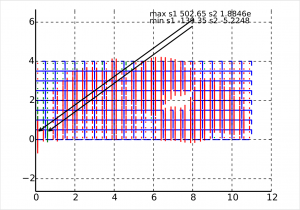 A relatively rough discretization is chosen. The base configuration uses 170 2D-quad elements, see Bathe96 [5.3.1], Belytschko01 [8.4], Zienkiewicz89 [7.6], and an extra linear elastic left hand lower support element. 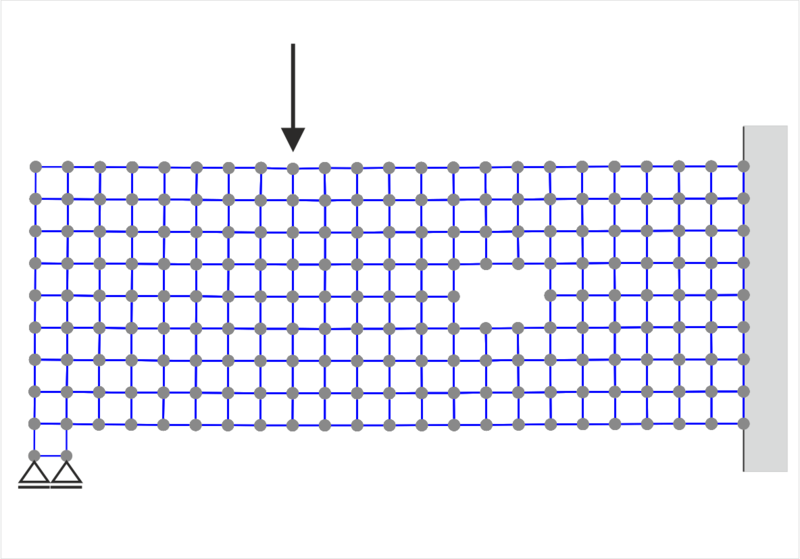 The high beam has a uniform reinforcement mesh, the first direction aligned horizontally, the second direction vertically. This is modeled with the layer model, see Book Section 6.3, with an uniaxial elastoplastic material behavior. Furthermore, additional single rebars are placed around the opening. They are modeled with 2D-bar elements also with the elastoplastic material law. Bond between reinforcement and reinforcement is assumed as rigid. Loading is applied as prescribed displacement of a center upper node as indicated in the Figure. Displacement control basically allows to catch ultimate load bearing states in contrast to load control. Results are presented in the following. 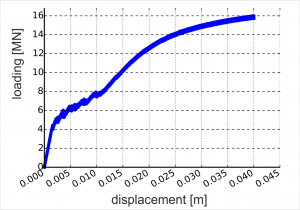 First is computed load-displacement curve of the node with a prescribed displacement. First impression is a thick line. Actually line thickness is caused by a dense zig-zag course arising from ongoing cracking of single integration points: every new crack actually means a system change and needs a new equilibrium iteration for the same prescribed displacement. This leads to a reduced reaction force or loading, respectively. Basically we have two loading points for one displacement point. This makes the line dense for a narrow spacing of displacement points. Nevertheless, the curve shows typcial reinforced concrete characteristics: uncracked state I, predominant cracking formation state IIa, more or less final cracking state IIb – more or less as still new cracks occur but considerably less compared to IIa – and finally predominant yielding of reinforcement state III. 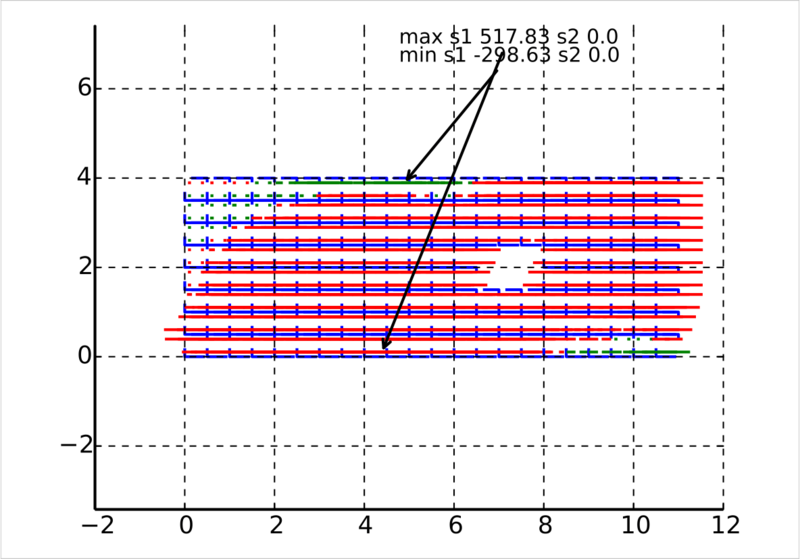 Second is computed stresses in the reinforcement web horizontally in the last last computed step. First impression is widespread red horizontal lines which indicate tension. 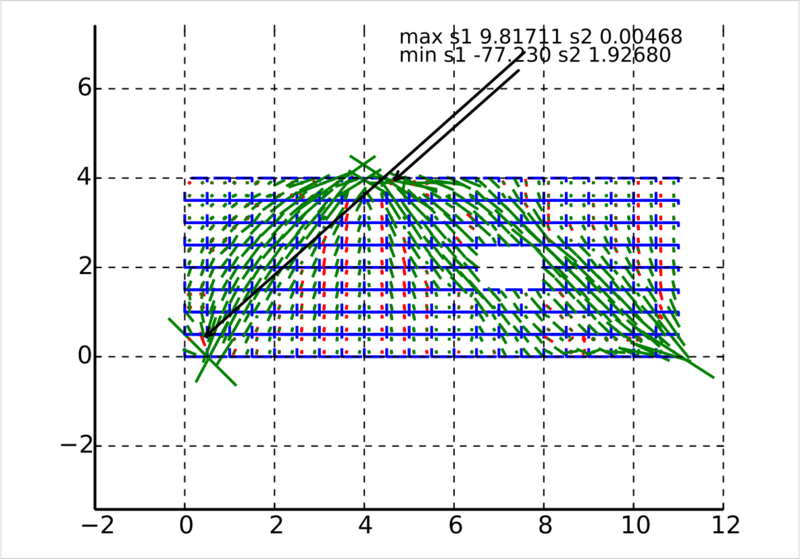 The direction indicates the stress direction, length of red lines indicates stress magnitude. Scaling is not perfect, so lines overlap. Two points are lifted, the first with maximum tensile stress and the second with minimum compression stress. The assumed yield limit of 500 MPa is exceeded for the former with utilization of some hardening. Maximum stresses basically arise at bottom side midspan and top side right end. Notice, the right end is clamped over the whole high beam’s height. This distribution corresponds to a beam model. 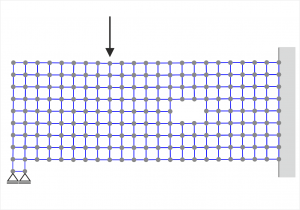 Third is computed stresses in the reinforcement web horizontally in the last last computed step. First impression is widespread red vertical lines. The same notes basically apply as before with changed orientation. 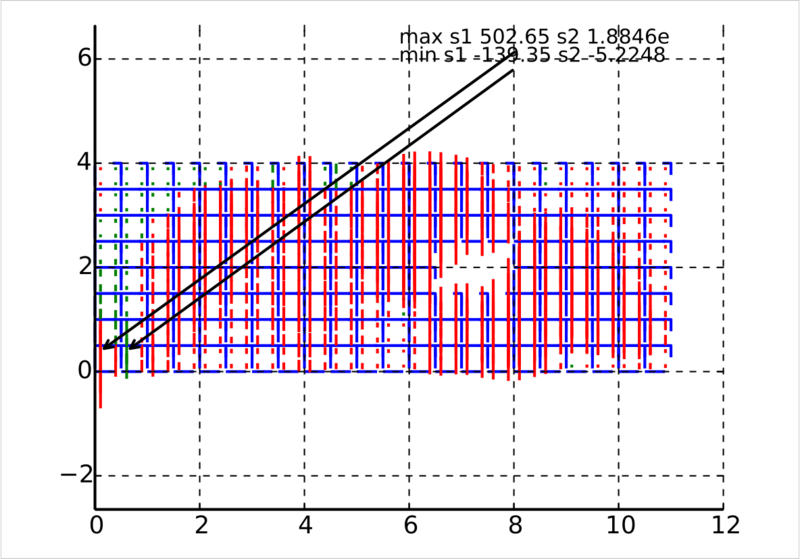 Distribution of reinforcement stressing within the high beam changes. This is not comprehensible with beam models. Nevertheless, the vertical mesh is essential to make the high beam working. 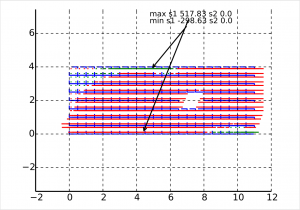 Finally, computed principal stresses for the concrete in the last computed step. A prinicipal stress state has two components and an orientation. A green color indicates a compressive principal stress, a red color a tensile principal stress. 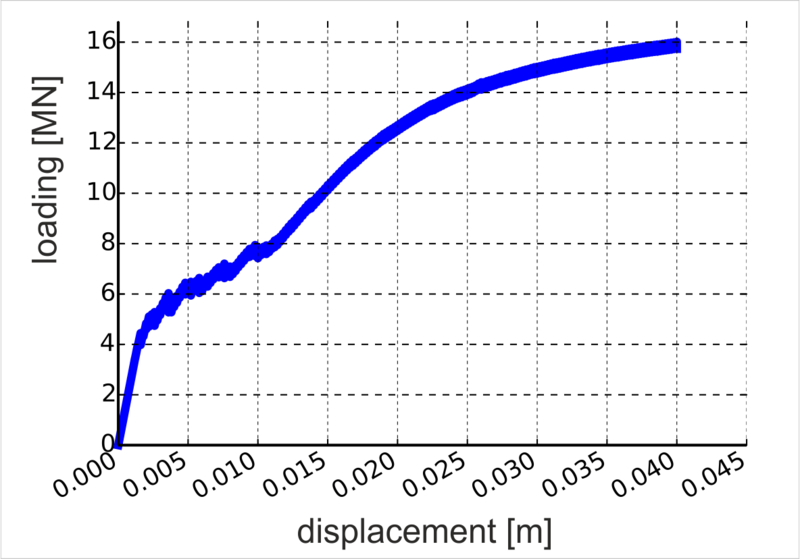 A tensile stress is allowed due to (a) the prescribed tensile strength of concrete, (b) imbalanced residuals of the finite element equilibrium iteration, which fall below the prescribed convergence limit, (c) the assumed viscosity. The major contribution of concrete naturally comes from compression. It can be nicely seen how two concrete struts form whereby the right one strives to circumvent the opening. Two points are again lifted for the principal concrete stresses, indicating the point with the largest principal tensile stress and its orthogonal counterpart and the largest (by amount) principal compressive stress and its orthogonal counterpart. The tensile stress more or less violates some prescribed criteria. The compressive stress is allowed by the material model (2D linear elastic with limited tensile stress according to Rankine criterion). But the material model obviously is not realistic for normal graded concrete which cannot sustain roughly 80 MPa. We should look for better models. To be continued. Stay tuned. This entry was posted in load induced concrete anisotropy by uhc. Bookmark the permalink.